Pattern design. Rays - straight and curved. All ray patterns are created using fan pattern. Both clipping blocks and no-sew zones are used to place them as background fills. I make most ray patterns double stitch because this eliminates any transitions at the no-sew zone, next to the motif they are surrounding. Straight Rays and Curved Rays. These were created in the same way, one using the straight line from the geometric catalog, the other using arc. Copy pattern > touch the straight line > continue > move the copy right on top of the original. Finished. Combine patterns > touch the line > continue > touch the line a second time. You’ll know when you’ve selected it because a continue button will appear. Touch swap start/end points > continue > finished > add pattern > fan pattern. Touch the pattern > continue. For the straight rays, I made the angle 10º and the repeats 36. Grab the pivot point and move it so it is at the other end of the line. This puts the start/end point on the outside with the rays joined by straight lines. The curved rays were made in the same way but I used arc from the geometric catalog. I made the angle 5º and the repeats 72. You can make your rays any distance apart that you like. If you want fewer rays, make the angle larger and the repeats less. Just make sure that the angle and the number of repeats comes to 360 when they are multiplied together. To use the rays as background fill, I first placed the pattern motif in the block. I selected add pattern > block pattern and found my saved rays. I scaled up the rays so they filled the block to the corners and centered them in the block. Add block > no-sew zone > touch the rays > continue > create pattern contour > touch the motif > continue > Gap: 0. Smooth: 0%. Points: rounded or sharp – switch between the two to choose the best one for the motif. Touch outside the motif > finished > finished. The transition choice is irrelevant because the rays stitch straight in then straight out from the motif. If, however, the rays cross over and into an interior part of the motif (see the bird below), choosing jumpstitch or tie off might be a better choice. Note: If the pieced block isn’t a perfect square, rotate the rays so that they don’t go right into the corners. This will disguise the irregular piecing. See the heart and bird with rays below. The rays don’t have to be centered in the block – try placing them off-center for a different look. A demonstration of how tweak can be used to adjust a border pattern so that it will fit the remaining space. Quilting always draws up the fabric and so as the pattern stitches, the space that's left can be smaller than when the pattern was placed, which can cause a problem because the pattern may end up stitching into a previously stitched area. Stopping the stitching a short distance from the end allows the pattern to be tweaked so that it fits correctly. Tweak stretches or shrinks up a pattern - it doesn't cut anything off. If you prefer to watch this on Youtube, go to this link. There have been some questions about clipping blocks recently so since I am using that feature a lot on the quilt I am currently working on, I thought I'd make this short demonstration video. I don't know why but there are a couple of jumps at the beginning, however, nothing is missing - it's just a quick move from one iQ screen to the next. I am using iQ version 07.04.16. If you see some pop up windows that appear on my iQ that you've never seen before, it may be either because of the version I'm using, or because of the way I have my configurations (or preferences) set. Remember to look at those gear buttons whenever you come across them to find the local configurations that allow you to set iQ to suit you. Sending logs to support using a Mac. This is a step by step to help those who have Mac computers and need to copy their logs and send them to support for help. Click on the pictures to enlarge them. 1. At the main menu on your iQ tablet, touch system. 3. Attach your thumb drive and iQ will transfer the logs. 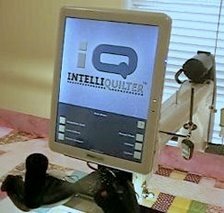 6.Go to intelliquilter.com and find support in the left menu bar. 8. Touch 'Choose file'. This is what I see when I do that - a window opens up automatically showing a list of my documents. 9. I want to see my thumb drive, so I scroll down the left hand side menu of that window until I see GREEN IQ. 10. I click on that and it opens, showing me all the items on my thumb drive. 11. I click on logs.tar.gz, then 'Choose' at the bottom right. The window closes by itself. 12. My logs are now automatically attached to the support form. You can see them listed next to the 'Choose File' button I selected. You do not need to choose any more files. Complete the form and submit it to support.